Last weekend, Tyler and I had the once-in-a-lifetime opportunity to witness a Korean wedding. Sessy, our English friend who we met at the EPIK orientation, got married to Myung Seo. The two met in Korea through mutual friends several years ago. Sharing with them in their momentous day was so special and certainly something we will never forget. The event was held at the Chungnyeolsa Shrine, a gorgeous and ornate edifice that was set atop a high platform overlooking beautifully kept grounds below of trees, foliage, and koi ponds. We found Sessy and Myung Seo taking pictures in these picturesque surroundings when we arrived about an hour before the wedding began. Sessy and Myung Seo chose to have a very traditional Korean wedding. Many Koreans nowadays choose to have a Korean/Western hybrid wedding or just a Western wedding all the way around. 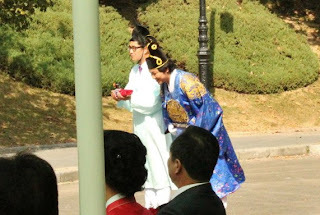 It's very uncommon, so my co-teachers said, to see a strictly traditional Korean wedding anymore. 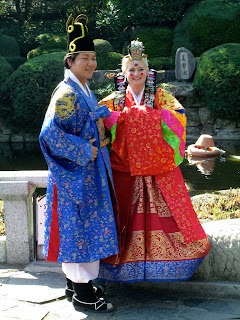 Sessy and Myung Seo wore traditional, brightly colored hanboks. After the wedding, Sessy told us, "I was sweating like crazy because I had five bloody layers on!" Despite the sweating, I think that both the bride and the groom looked absolutely stunning. Another thing that made this wedding particularly special was that Sessy and Myung Seo had invited Tyler to be in the wedding! Tyler got to be a part of the wedding parade, or Ch'inyoung. He was the official pink-robe-wearing umbrella holder. He looked so pretty! Tyler actually lucked out with his position as the umbrella carrier. 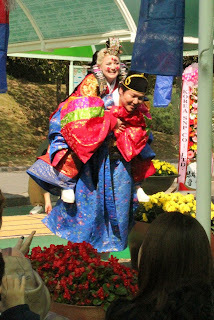 Two of our other friends who Sessy and Myung Seo invited to be a part of the wedding parade had to carry the groom and the bride into the ceremony. A picture of the entire wedding party is shown below. Aren't they cute? The ceremony itself was very complex and packed with Confucian rituals. 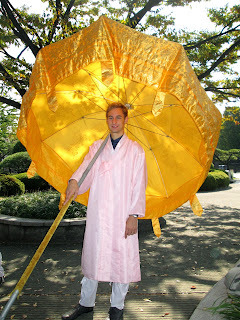 I should have researched Korean weddings before I came, because for me, it was all just confusion rituals. Bad pun. Anyhow, after the ceremony, I read up on the different parts of the wedding and everything became much clearer. The first thing that happened was that Myung Seo was handed a little wooden goose. Apparently, this is called Jeonanrye and is a very important marriage symbol. Myung Seo placed the wooden goose on the ceremony table before the bride was carried in. 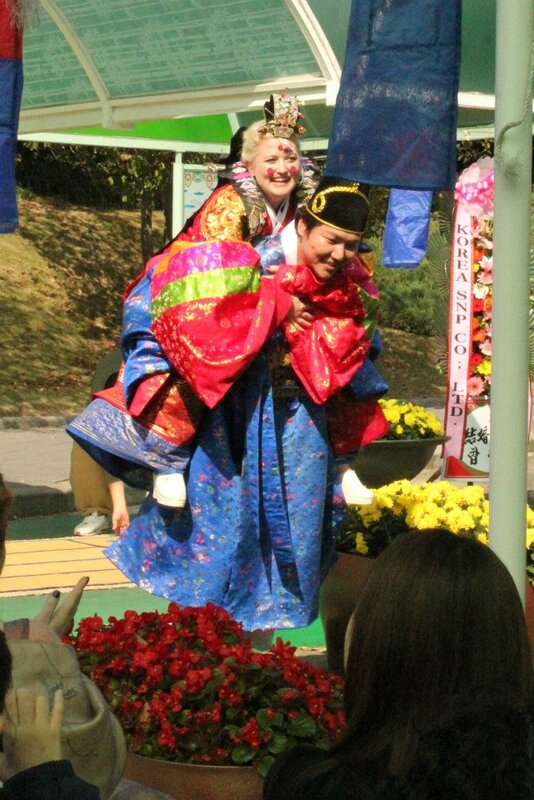 Next, Sessy was carried into the ceremony. After both the bride and the groom were situated beside the wedding table, a series of bowing took place. This is called Gyobaerye. The attendants of the bride and groom helped them bow at the appropriate times. 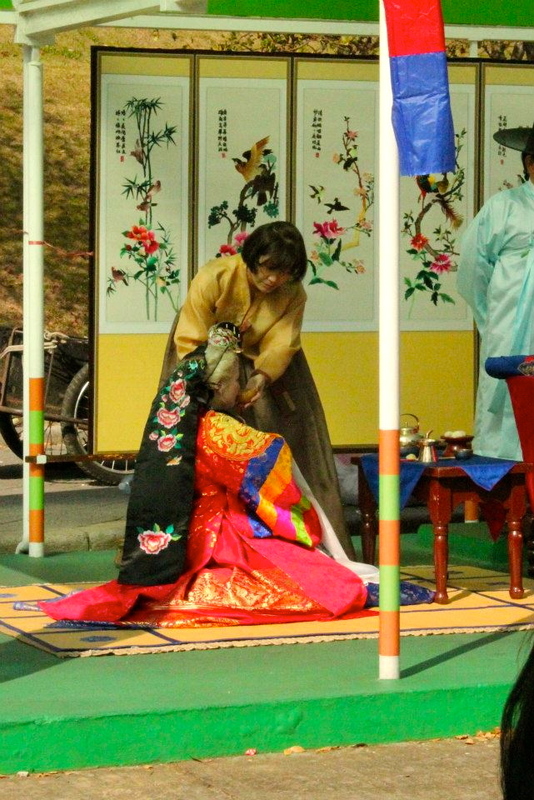 Next, Sessy and Myung Seo drank from two halves of a gourd (Hapgeunrye). The drinking signified the destiny of the new husband and wife and their harmony together. Drinking out of two halves of a gourd symbolized that they each make up one half and only be considered whole when they are together. At the end of the ceremony, Myung Seo carried Sessy out on his back! Apparently, this is not a Korean tradition and neither Myung Seo nor Sessy knew that they would be instructed to do this! After the ceremony ended, the bride and groom took more pictures with their extended families. After photos were finished, all of the guests went to a nearby Korean restaurant to have a traditional Korean lunch. 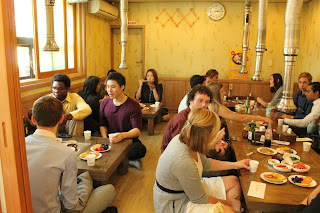 We had plenty of delicious food, shared between guests at each table, and an unlimited supply of soju and wine! We had such a memorable experience at Sessy and Myung Seo's wedding and were so lucky to be a part of their day. We are looking forward to many adventures ahead with this wonderful couple! This blog about our wedding is truly breathtaking Natalie. We haven’t had the opportunity to get on-line of late, as you can imagine, so to read this was beyond doubt overwhelming, thoughtful and kind. Thank you so much. We will be printing this out, along with organising photo albums and little mementos. We need a little bit of time to recuperate, but as soon as we’re good to go, we’ll be in touch to do something great together. Stay well until then and give Tyler a big hug from us both for doing such a great job on the day! What a great experience you had! Actually, most Korean weddings are combined with western and traditional ceremony. Normally, western ceremony is first and then we move to other place in the same venue for traditional ceremony. piggy bagging is common after ceremony, but don't know why. 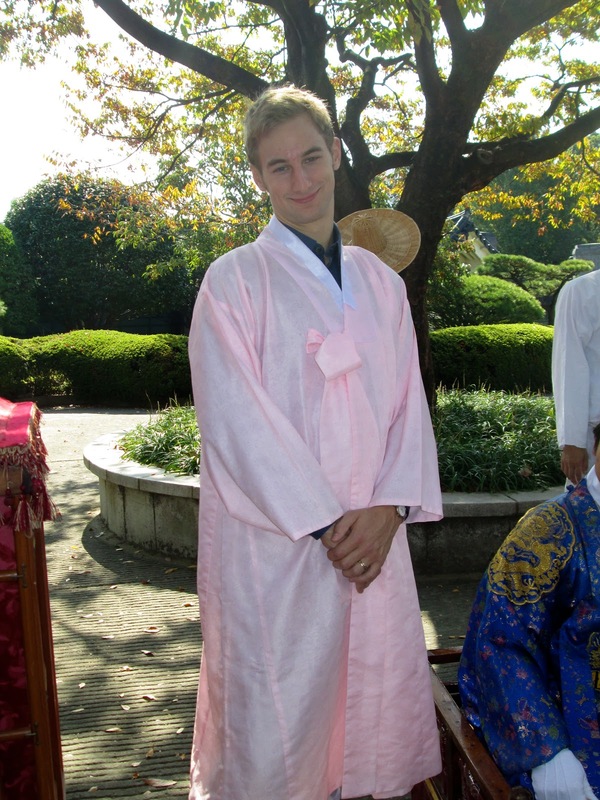 Yes, Tyler looks pretty in pink hanbok. Natalie, you should try some colorful hanbok. tons of colors you can choose from.